Co-operation is at the heart of Fairtrade, and as a co-operative council we are committed to doing as much as possible to support and promote Fairtrade in the borough. The Council, along with a number of schools, businesses and organisations have agreed to work together and in 2013 launched the Telford and Wrekin Fairtrade Alliance. Media coverage of Fairtrade events. Most recently, the Alliance promoted Fairtrade through a schools recipe competition, (sponsored by the Midcounties Co-operative) launched in January 2014. Working with teachers, the topic of Fairtrade was introduced to lesson plans to teach pupils more about the trading of goods and how we can make it fairer. Pupils were then encouraged to design a Fairtrade recipe, including at least one Fairtrade ingredient and one healthy food option. We were very pleased with all the wonderful recipe ideas that pupils put forward, clearly showing their understanding of the subject and demonstrating their creative ideas. 209 pupils took part in total. Pictured below are the winners of the primary age category. The Cooking Club from Windmill Primary School were presented with their prizes by the Mayor of Telford & Wrekin, Cllr Leon Murray. Following this, we launched into Fairtrade Fortnight 2014 (24th February – 9th March). 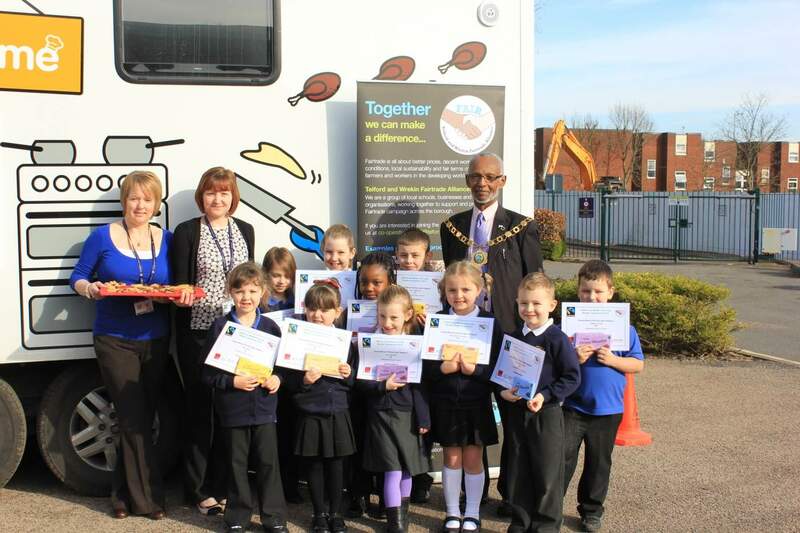 For our part, the Council organised a cooking bus tour of the borough visiting schools to promote the campaign. 259 pupils took part in this, preparing and sampling the winning recipes from the competition and learning more about “making bananas fair”; this years campaign organised by the Fairtrade Foundation. Due to the excellent response to the competition, we wanted to showcase the pupils’ work and have since put all the recipe entries into a Fairtrade Recipe Cookbook. Another big partnership event was held at a local secondary school, and organised by the Midcounties Co-operative. Working co-operatively with other local schools, children took part in a number of Fairtrade workshops. This included learning a Fairtrade song and dance routine with an educational theatre group and taking part in a paper bag making enterprise game. This was followed by an evening performance for parents to see what the students had learnt. A number of stall holders attended, including the Council and other members of the Alliance to promote the Fairtrade campaign. There was also an opportunity to make banana smoothies on a smoothie bike. Other examples of partnership events during the Fortnight include a banana throwing competition, selling Fairtrade “dishes of the day” in canteens, promotional offers, coffee mornings, Fairtrade church services and school events.